In the film Pinkwashing Exposed: Seattle Fights Back, Stefanie Fox, Co-Director of Organizing for Jewish Voice for Peace, has the ADAPT Celebrate People’s History poster on the wall behind her. ADAPT is a direct action disability rights organization that has fought for accessibility for disabled people for decades in the United States. This poster is one of a number of posters on the wall of what looks like Fox’s office and it is, likely, coincidental that it is in the film at all. But, it isn’t coincidental that a queer organizer against Israeli apartheid has a disability organizing poster on her wall because these struggles are connected. Israel produces tremendous suffering and misery because of its occupation, apartheid system and ongoing attacks on Palestinians. If you are concerned about disability justice, you need to be concerned about Palestine; if you are concerned about justice for Palestine, you need to be concerned about disabled people. Pinkwashing is the practice of using LGBT (and sometimes Q) people and rights discourse to erase injustices. This happens in lots of different ways but is most common during gentrification and with respect to Israel’s occupation of Palestine and apartheid system. Israel markets itself as a haven for LGBT people and uses this to conceal its other human rights abuses. One of the things that the film Pinkwashing Exposed talks about a lot is how Israel is only welcoming to certain LGBT people while actively oppressing LGBTQ Palestinians. A central message is that you can’t pretend to separate queers from Palestinians because this erases Palestinian queers. The film largely centres around Queers Against Israeli Apartheid’s campaign to get the City of Seattle’s LGBT Commission to cancel a meeting about LGBT rights in Israel. The meeting, which was funded by the Israeli Consulate, was part of a propaganda tour for Israel. There was a massive backlash against the QAIA organizers in the mainstream LGBT community in Seattle. The gaygeoisie (gay ruling class) worked to separate ‘politics’ from LGBT issues – erasing the experiences of Palestinians. While it focuses on Israel’s injustices and the queer fight against it, the film also raises important questions about the depoliticization of LGBTQ issues and communities, which I think is both wrong and dangerous. I also think it is important for everyone, queer, trans or not, to question how the rights of the groups you are a part of are being used to legitimize unjust states and erase oppression. For disabled communities, this means thinking about how things like the Ontarians with Disabilities Act and the Americans with Disabilities Act are used to erase the injustices that lie at the foundation of the governments that passed them (especially colonialism and capitalism which these laws actively work to gloss over). Does it really make things okay if some disabled people in Canada and the United States can get in the front door of a building on stolen land? 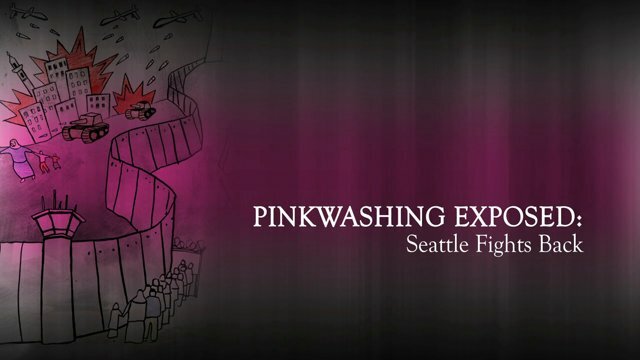 I really recommend you watch Pinkwashing Exposed. It is now free online (56 minutes, English captions available). More than just watching it, it is important that each of us actively work to fight pinkwashing, disability washing (some people call this cripwashing – which is a better sounding word but I hate the word crip) and all of the attempts to pit oppressed communities against one another. For more on disability issues and Palestine, read my post: Gaza: Why Care; Why Act. This entry was posted in Colonialism and tagged Palestine, queer, rights, Trans. Bookmark the permalink.